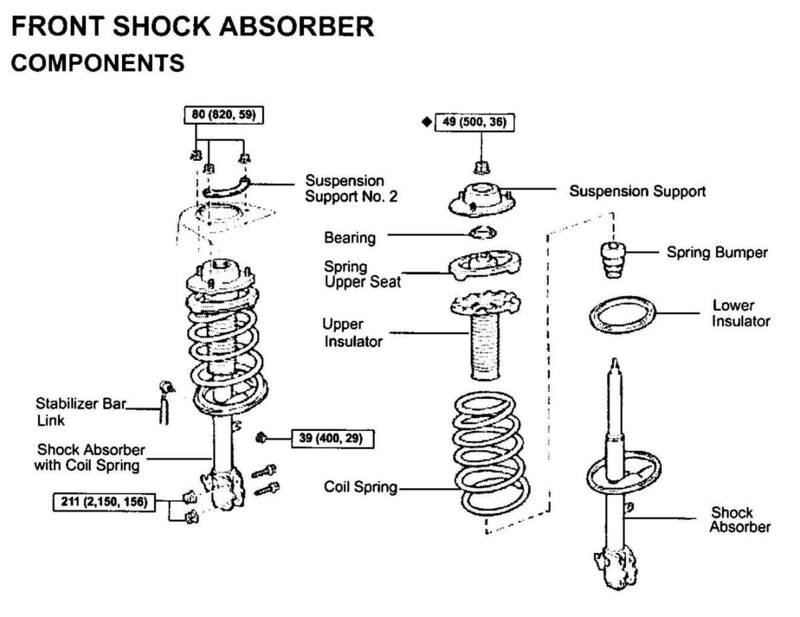 This article provides you step-by-step instructions for replacing the upper strut mount and the stabilizer link for a Honda Odyssey. The repair was performed on a 2002 Odyssey. The repair method can also be applied to the Honda Pilot and the Acura MDX since they share the same front suspension design. 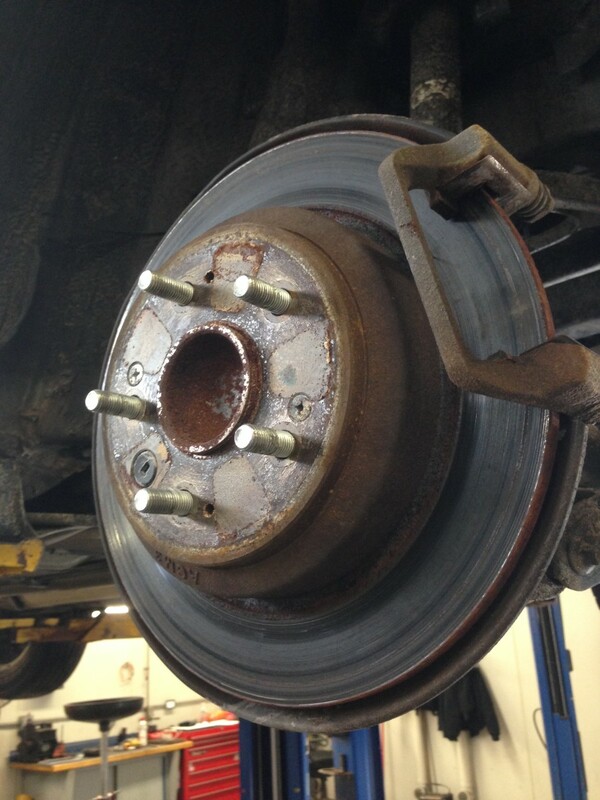 My customer had been complaining of various noises coming from the left front corner of his Honda Odyssey. I couldn't connect the noises to a specific part; I believed they were due to a combination of his upper strut mount and stabilizer bar link (also referred to as a sway bar link). After I removed the mount, the bearing casing popped off and all the bearings fell out, as you can see in the video below. This bearing was the cause of at least one of the noises. The other noise was coming from a worn-out stabilizer bar link. The lower ball-in-socket connection point had worn out, resulting in metal-to-metal contact without any grease lubricant. Replacing both parts eliminated all noises from the left front corner of the car. I recommend using high quality spring compressors as well as a powered impact driver to perform this repair. I used three spring compressors instead of two to make the job safer and easier. 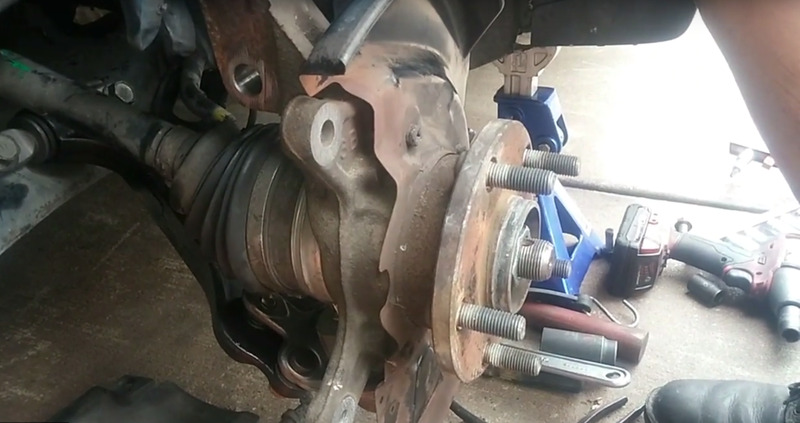 This eight-minute video will provide you with visual step-by-step help for completing the removal and replacement of a Honda Odyssey upper strut mount (including new bearings) and the stabilizer bar link. The steps are also described lower down in the article. 1. Remove the 10-mm bolt that holds the brake line bracket to the strut. 2. Remove the 10-mm bolts that hold the ABS line brackets to the strut and to the chassis of the car. 1. Unbolt the two lower nuts and bolts attaching the strut to the steering knuckle. 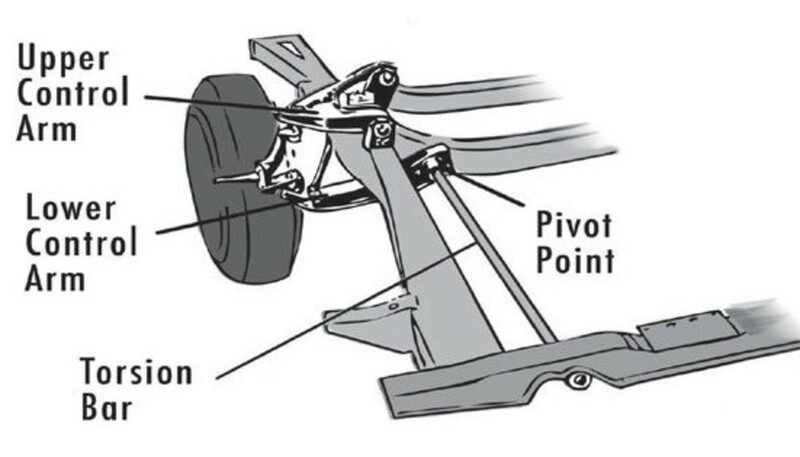 If the strut will not separate from the steering knuckle, use a pry tool to pry off the connection or work it loose with wiggling action. 2. 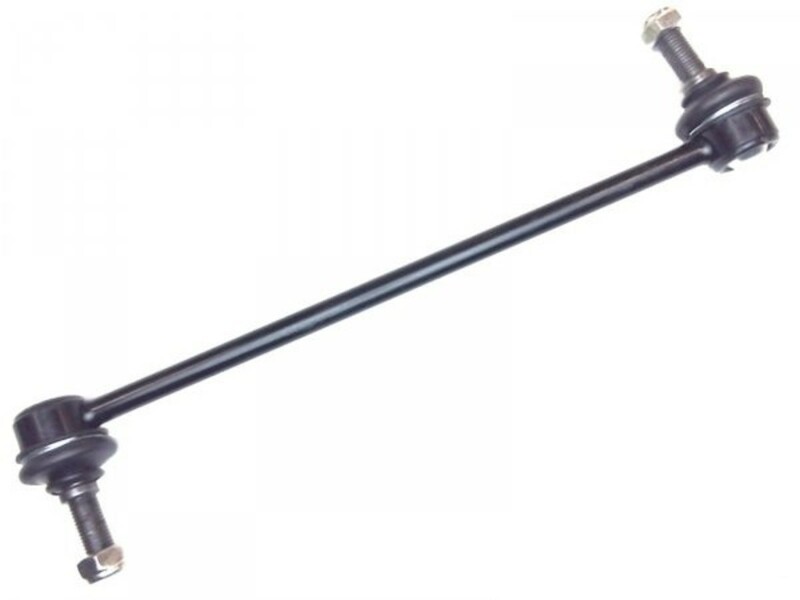 Detach the sway /stabilizer bar link from the suspension strut. If the stud of the link connection point rotates with the nut, insert a hex socket into the stud to keep it from rotating. A box wrench or pass-through ratchet wrench must be used to remove the nut. 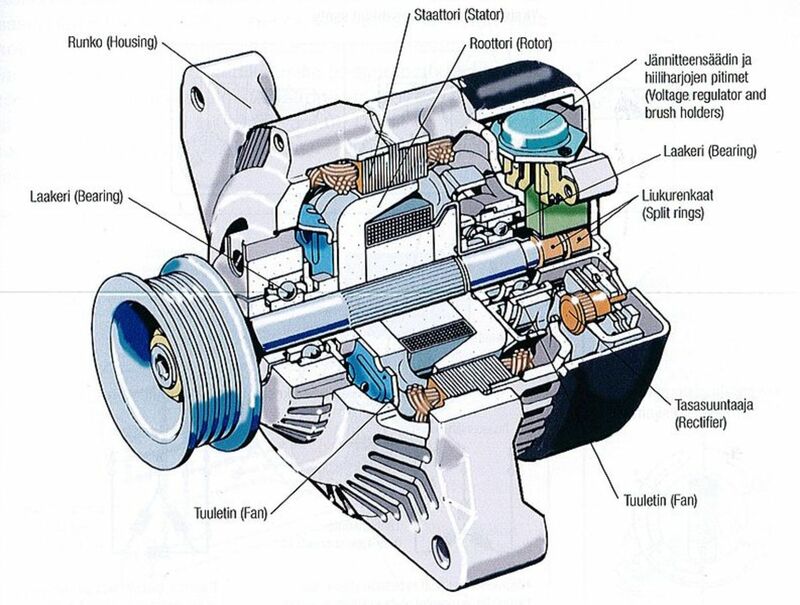 Apply penetrating oil on the threads and work the nut off by applying both clockwise and counter-clockwise torque until the nut spins with less resistance. 3. From the engine compartment, remove the round plastic tabs to provide an access path to the three upper strut nuts. 4. 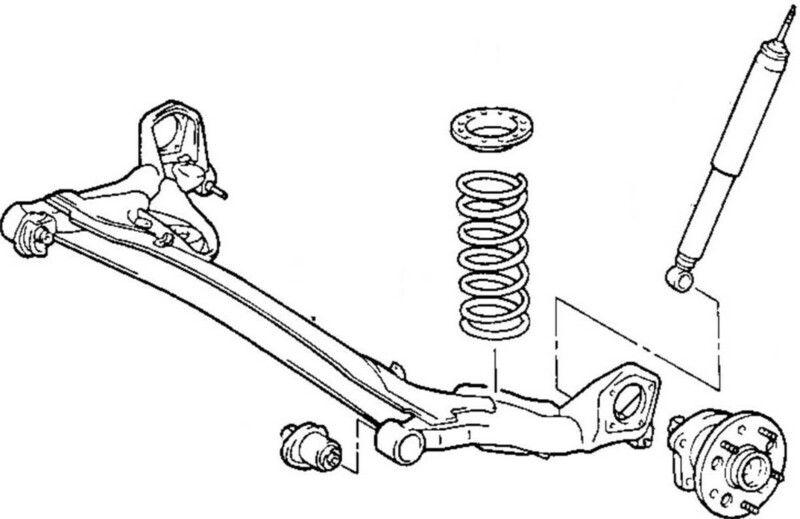 Use a ratchet wrench with an extension to remove the nuts that hold the upper portion of the suspension strut. While removing the last nut, hold the strut with one hand to prevent the strut from suddenly dropping down when it is released. 5. Use a magnetic wand to extract the three strut mount nuts. 1. Mount three spring compressors onto the strut spring 120 degrees apart from each other in a triangle formation. This works out better and safer than two spring compressors. 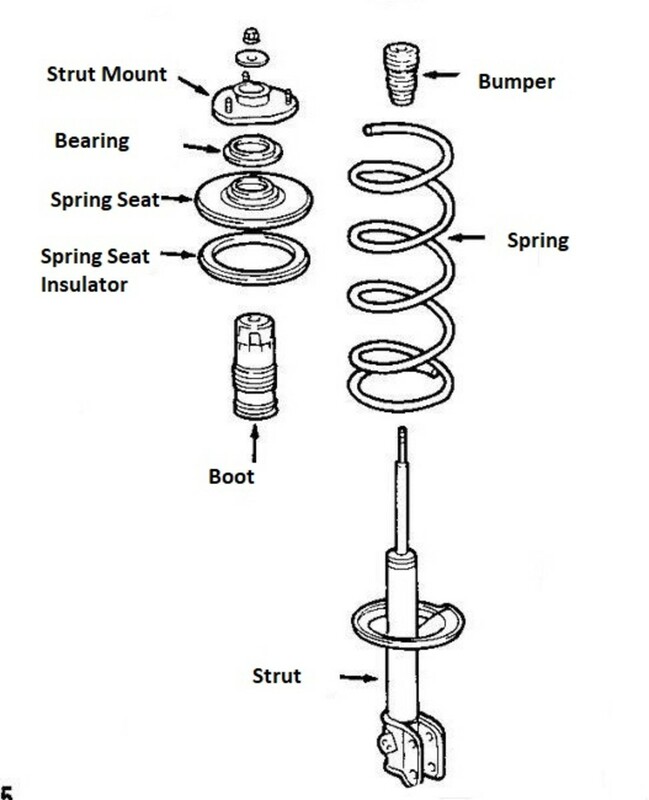 Two compressors may not be able to compress the spring far enough to relieve spring tension on the upper strut mount. Whatever spring compressor tool you use, ensure it has safety pins so the compressor mounting points cannot slip off. 2. Apply equal tension on the three spring compressors (preferably with a powered impact driver tool) as you apply tension onto the springs. 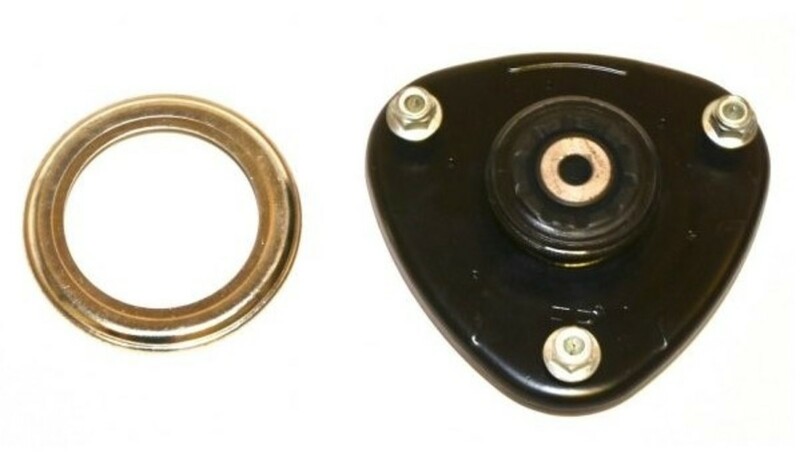 When spring tension begins to come off the strut mount, the strut mount should be easy to rotate with your hand, or you should be able to place a screwdriver between the upper spring seat and spring to create a gap. 3. Apply penetrating oil to the strut nut and strut stem on top of the strut mount. Using a box wrench or pass-through socket wrench, torque the nut off while holding the strut stem with a ratchet wrench and socket or another box wrench. 4. Remove the nut, bushing, and bearing from the upper strut spring seat. 1. Clean the contact surface where the new bearing is to be mounted. 2. Position the strut assembly upright and install the new bearing and strut mount. 3. Torque on the strut stem nut using the same tools during removal. 4. 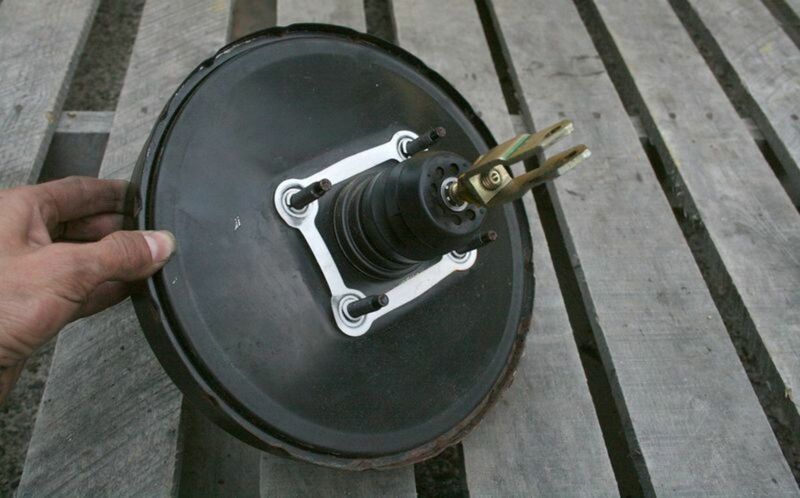 Lay the strut assembly on its side and begin releasing tension on the spring compressors. Release the tension on the spring compressors equally. 5. Turn the strut mount until the studs are lined up with the chassis mounting mounts. The new strut should have a alignment mark pointing to the front of the car. 1. If you plan to replace the stabilizer bar link, remove the old link from the stabilizer before re-installing the suspension strut. Use the same tools to remove the link from the suspension strut. 2. Position the strut assembly lugs through the three chassis mounting point holes. A second pair of eyes will be helpful to help align the lugs. Using the tools you used earlier to remove the nuts from the chassis, bolt on the nuts that secure the upper strut mount to the chassis. To prevent the nut from slipping off the socket of the socket wrench extension, place a small piece of paper towel between the nut and the socket (see video below). This will prevent the nut from coming out of the socket when the socket is inverted. 3. Wiggle the steering knuckle onto the suspension strut and align the holes for the strut bolts. Push and wiggle in the strut mounting bolts. Screw on the mounting bolt nuts and torque down. Re-install the ABS and brake line connectors in the reverse order in which you removed them. Install the new sway / stabilizer bar link. 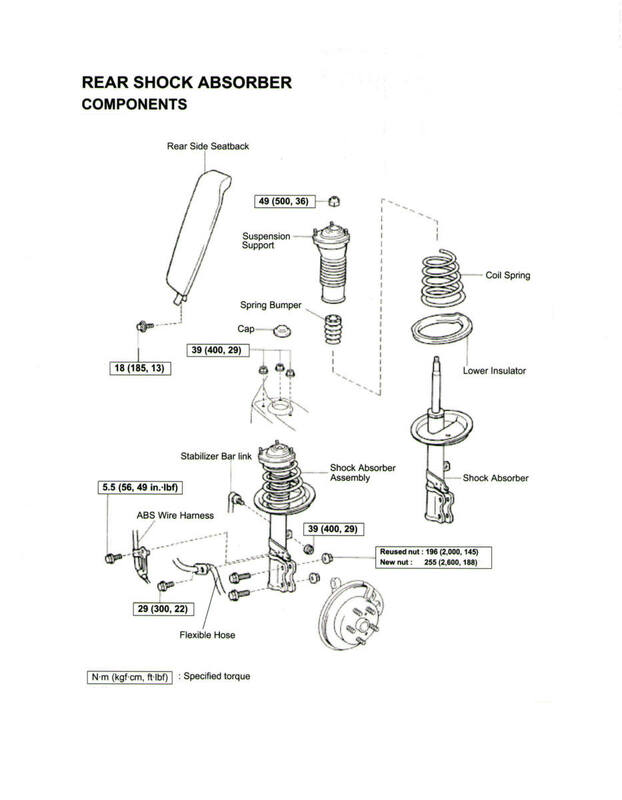 Bolt it on to the suspension strut and sway bar using the same tools you used for removal. Thanks for your kind comments. My partner and I are always striving to make every new video better than before. Extremely clear, professional quality video. Thanks for making and posting it. I am going to put up with the noise in my 2005 Honda Odyssey for a while longer. When I am ready to replace the upper mount I will certainly use this video as a guide. Thanks again.